Hoarding: The Problem With: "If Only I Had a Big Farm..."
One of the phrases we hear most often in sheltering is "If only I had a big farm..." followed by something like, "I'd take them all home," "I'd start my own rescue," "I'd be a crazy dog lady," etc. As lighthearted as the intent is, what they actually mean is... "If only I could be a hoarder." That's the underlying message that can lie behind innocent statements about wanting to help as many animals as possible. Of course most people are simply kidding, and are just referring to their overwhelming desire to do something to help. But when people seriously consider opening a nonprofit rescue or shelter or a "Big Farm," it's imperative that they consider all the requirements and long-term effects of that decision. Some of them even end up as animal hoarders. Let's examine what starting Big Farm would actually be like. Once these things are done, Big Farm is well on the way to being able to accept donations and volunteers. It often takes a year or more, and there are fees involved along the way. Once Big Farm is a registered nonprofit, then what? The thing about animal welfare, especially in the Midwest and in the South, is that it is still a constant uphill battle. There will always be more animals in need than can be helped by Big Farm at any one time for the foreseeable future. (Spay & neuter!) Those who do not keep their heads and stay realistic are the ones who end up getting in way too deep, with way too many animals in their care. In sheltering this is called "Capacity for Care," or knowing the maximum number of animals you can effectively care for. One of the first steps an animal welfare agency like Big Farm needs to do is establish its C4C. And C4C also needs to be reevaluated regularly with staff or volunteer turnover, if there is a high number of special needs animals, if revenue is down, or anytime another situation changes. For example, caring for 5 puppies is going to be a whole lot different than caring for 5 senior dogs. The puppies could most likely share 1 space at Big Farm while the senior dogs would take up 5 separate spaces. Puppies will fly out the door and get adopted very quickly at almost any price, while seniors tend to take much longer (racking up more operational costs while they wait.) The Capacity for Care will vary widely depending on each organization and the type of animals they are serving. Brick and mortar shelters will have a different C4C than a foster-based organization. What often happens with rescue organizations is the "just one more" mindset. Taking in just one more won't be so bad, right? There's room for just one more. There's enough food today, here and now. But this is an extremely slippery slope. If you take in this one, what happens when your phone rings tomorrow and there's a dog or cat in even worse shape? Will Big Farm take that one also? There's food now, but will you be able to buy more food next week? And that's when the problem begins... when the heart overtakes the mind. "But Big Farm will have lots of donations, grants, and volunteers to help." The short response? No, you won't. Not at first. Volunteers are just that -- they come in voluntarily. While they are incredibly valuable to an organization, they are typically only available a few hours a week. They can come help at Big Farm when they'd like, and if they are feeling ill or decide to go on vacation, they are free to do that. (As they should be.) Occasionally there will be a volunteer who contributes 20, 30, even 40+ hours a week. And while that is so very helpful, it can be dangerously easy to burn out volunteers like this. It takes time and patience to build a reliable volunteer base where the work is spread out evenly enough to not take advantage of anyone. When housing animals at a facility or on a Big Farm (as opposed to foster homes) they have to be cared for 7 days a week. 52 weeks a year. From New Year's Day to Christmas morning and every day in between. If there aren't enough volunteers available, that responsibility must fall on paid staff. And to have paid staff, Big Farm must have consistent, reliable funding to make payroll each week. And here's another hint: very, very few grants will provide funding for payroll. Regarding donations & grants, it takes time for an organization to build up a reputation in a community for people with disposable income to feel confident donating. And of course, those people have to be aware of the organization in the first place. If Big Farm doesn't have a social media following or billboards around town (which cost money) or a very visible location (which usually also costs more money), then no one will know to donate to them. Grantmaking organizations want to see statistics on what you've done, concrete plans of what you'll do in the future, and exact documentation about how you manage your finances. Simply saying "Big Farm rescues dogs" is not nearly enough. The paperwork required for grantwriting & reporting takes a significant amount of time. But there are just so many homeless animals. Wouldn't starting Big Farm help me save more? Most likely, no. For all the reasons stated above, starting any charity is a long, complicated, and sometimes expensive process. Those who are passionate and want to help animals are much better off volunteering their time and skills to an existing agency, instead of starting their own separate organization and spending more time doing paperwork and fundraising. Most shelters and rescues are constantly begging for foster families, adopters, and volunteers. They are already "competing" for media attention and donor dollars. Then enter hypothetical Big Farm into the picture. Let's say that Big Farm appears on a local TV station with an adoptable pet. Suddenly, members of the community have yet another shelter logo in their news feed. They may have never heard of Big Farm, but now they will go research them. That's great for Big Farm. But what about all the animals at Shelter B down the street who just missed out on that opportunity? It would have been more effective for someone to simply volunteer to take a dog from Shelter B to the TV station each week. The number of "rescues" and "sanctuaries" has been ever-increasing in the past few decades. While many of them are doing excellent work alongside one another... it becomes very easy for places like Big Farm to become overwhelmed and do more harm than good. Another happened right here locally in 2017. A woman who started a "sanctuary" for senior dogs began "rescuing" them from shelters in the South, until she had almost 70 with no intentions of adopting them out at all. She also had more than 20 cats. Coincidentally, Animal Sheltering magazine published by HSUS covered this very topic in their most recent issue with this compelling article, "When Animal Rescue Isn't." So the next time you're dreaming of your very own rolling green hillside filled with happy adoptable doggos... imagine the work involved, and remember that by starting a whole new organization you could easily be undermining the good work of your established local agencies. See if you can start by fostering a dog. Cleaning a cat cage. Pitching in with a fundraiser. Ask if there are any seats open on the Board of Directors. (Yes, all of these are things that the VHS needs all the time! Email us to get involved!) 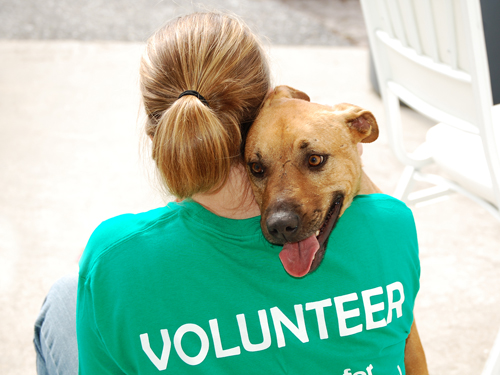 So many skill sets are needed, and YOU just might be exactly what your local shelter is hoping for!